Welcome to my new series of posts about Australia. This time I travelled from Darwin, capital of the Northern Territory in Australia to the centre “Alice Springs” and Uluru/Ayers Rock. Plus bonus: 2 days in Sydney. To start off my new series: An article about Darwin. Darwin, named after the naturalist and geologist Charles Darwin is a “small” city of approx. 129,000 people. It’s only about 4 hours flight time from Singapore and many other major Asian cities. So head out into the Territory! Darwin has a a lot to offer. Period. Here are some examples. This amazing museum and gallery features collections of different animals of the past, aboriginal art collections, paintings from Arnhem Land and dot paintings from the desert. Also they give the opportunity to learn more about Cyclone Tracy , in a multi-room display with movies, pictures from the life before and the recovery phase and also features replica homes from the time before Cyclone Tracy hit Darwin. The Crocosaurus Cove is located in the heart of Darwin city, allows visitors to view Australia’s iconic Saltwater Crocodiles. And more the extra brave there’s an opportunity to Swim with the Crocs or to holding a baby Saltwater Crocodile. Many of y travel mate spent some time there and enjoyed it!. How about a relaxed afternoon by a water fall. 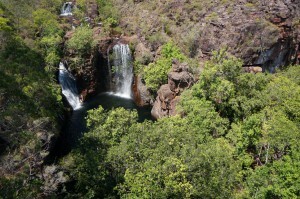 Then head out to Litchfield’s Florence Falls. 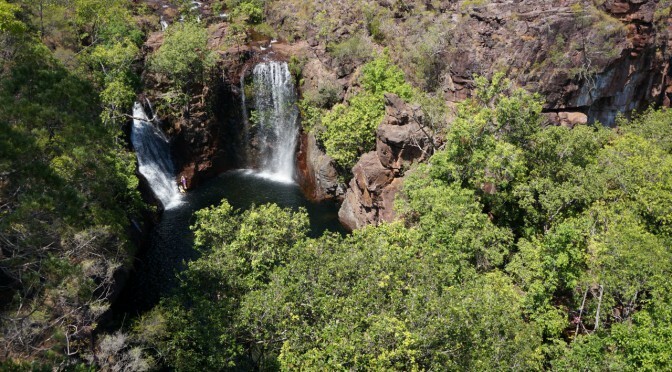 A place where you can swim under a waterfall and enjoy the sun or the shade under the trees.It’s a 2 hours ride from Darwin’s city centre. You like pizza? Try “il lido“, a Spanish restaurant, at the Darwin Waterfront. Their pizzas are amazing! Trust me. You’re a bit in party mood? Try Monsoons Restaurant & Party Bar. We enjoyed their interpretation of the Oktoberfest to kick-off our tour through the Northern Territory. They have a massive list of food and beverage options. And I am pretty sure the massive bar area will serve your needs. The hotel prices are a little bit above Australian average (I searched for hotels in several places in Australia). You can find accommodation from hostels, 1 star little motels up to 5 star luxury hotels with bay view. I stayed at the 3/4 star hotel/motel “Travelodge Mirambeena Resort Darwin”. They have both so called “motel rooms” and hotel rooms. A had the opportunity to stay at a “budget motel room” and at a “motel room”. My tip: Definitely spend a bit more of your bucks and upgrade to the motel room. More details in one of my upcoming reviews. Most hotels in downtown Darwin are in the walking distance of restaurants and Woolworth or other grocery stores. If you stay at the Travelodge Mirambeena Resort Darwin, Woolworth is just across the street. Darwin is situated in in the tropical area of Australia. This means Darwin has a wet and a dry season. The wet season begins in early October which is also the beginning of Spring. During my stay end of September/early October I had temperatures of up to 33°C during day time. In the summer you can expect temperatures of 40°C+. Keep in mind that you can exspect more rain during the wet season. The wet season begins in October. Stay tuned for more about the Northern Territory in the coming days!